On An Overgrown Path: Record companies and crowdfunders are you listening? Record companies and crowdfunders are you listening? 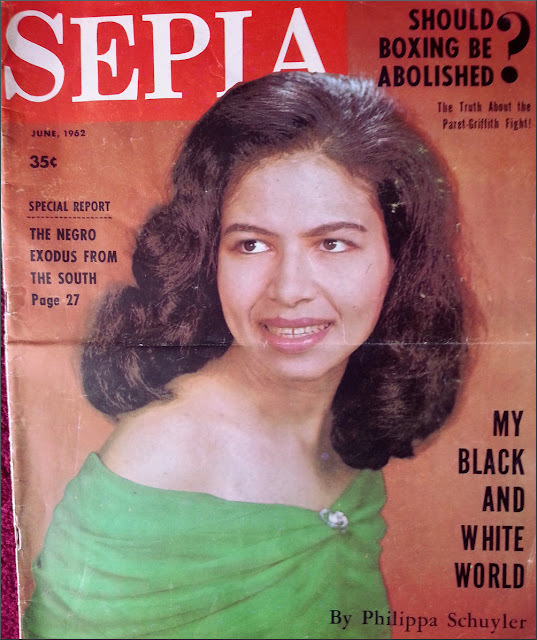 In 2011 I collaborated with John McLaughlin Williams on a two part feature about the composer and pianist Philippa Schuyler, who is seen above on the cover of a 1962 edition of Sepia magazine. The first Overgrown Path article Philippa Schuyler - genius or genetic experiment? told her life story, while in A Philippa Schuyler Moment her Nine Little Pieces for piano were analysed by John using a recording he very generously made especially for the blog - listen via YouTube below. Philippa Schuyler was the scion of an interracial marriage. Her father, George Schuyler, was a renowned and controversial black journalist, and her mother, Josephine Cogdell, was a blond, blue-eyed Texan heiress. Philippa rose to prominence as both a composer and pianist, and her compositions were performed by the Chicago and San Francisco Symphony Orchestras and the New York Philharmonic. But in the early 1960s her career stalled and she died in 1967 at the age of 36 when the US military helicopter in which she was a passenger inexplicably crashed in Vietnam. As a result of our articles the BBC broadcast a radio programme about Philippa titled The Colour of Genius in which John participated and which used his piano recordings. In the five years that have passed since the two Overgrown Path features and the BBC programme appeared great strides have been made towards giving women musicians the equality that is rightly due to them. But that equality has brought a new inequality, with women musicians of colour still not being given their fair share of opportunities and critical attention. It is no credit to classical music that the appointment of a few white women to prestigious positions in a repressive music establishment has been hailed as the end of decades of institutionalised, deep-rooted and continuing discrimination. Recently John McLaughlin Williams revisited our collaboration on Facebook, and this prompted a response from the black American composer and conductor Kevin Scott which is published below. In 2011 I wrote that the apparently insurmountable problem to assessing Philippa Schuyler's merit as a musician is that there are no commercial recordings of her as pianist or composer, and there are no published scores of her orchestral works. Kevin Scott's assessment of her orchestral music is an important step towards making the commercial recording which will finally bring her music to the audience it doubtless deserves. The Overgrown Path articles about Philippa continue to attract a very large readership, and they are one of the projects that I am most proud of. If Kevin's advocacy results in a recording, I will at last be able to carry out my oft-repeated threat to retire the blog with my work done. Here is Kevin Scott's commentary on Philippa Schuyler's music. Record companies and crowdfunders are you listening? The CD could feature both versions of the Nile Fantasy (1st version ca. 15 minutes, 2nd version ca. 22-25 minutes) in addition to all the other works whose total time is approximately 33-35 minutes. With the exception of her setting of excerpts from T.E. Lawrence's Seven Pillars of Wisdom for recitant and piano (Similar to Strauss' Enoch Arden), all works between 1946 and the mid-1960s are unfinished and in such a state that they can't be reconstructed (Example - her setting of T.S. Eliot's "The Love Song of J. Alfred Prufrock for chorus and orchestra barely lasts some thirteen to twenty measures in full score, unless complete sketches abound in another box of her music either at NYPL Schomburg or Syracuse University). "Seven Pillars of Wisdom", on the other hand, can be orchestrated, although the music serves more as an atmospheric accompaniment to Lawrence's prose, as one critic likened the music to Bartok, so anyone who attempts to orchestrate Schuyler's setting would have to take many things into consideration. One of the works that fascinated Philippa the pianist was Charles Tomlinson Griffes' thorny, expressionistic piano sonata which may play a significant role in her later compositions, both finished and incomplete. It was my goal back in the 1980s, and again around the late 1990s or early part of this century, to record the entire corpus of Schuyler's completed orchestral works. I had tried to interest Naxos to include her in their American Classics series, and almost had a deal to record the music in Belarus which fell through. To date I have not returned to this music, so when John McLaughlin Williams took an interest in it, I informed him of what the music is like and figured, since his connections are far more solid than mine are at present, that he could get a hold of the music and record it himself. I should note that I believe Schuyler's executrix is no longer with us, and that John or myself should contact Kathy Talalay, who has seen all of Schuyler's music at Schomburg. Header image from Alchetron. Any copyrighted material is included as "fair use" for critical analysis only, and will be removed at the request of copyright owner(s). Also on Facebook and Twitter. Her cause needs TV exposure for progress. It cries out for a BBC 4 feature, at least. Frank, thanks for that nice thought. But I fear BBC 4 TV is too preoccupied with repeats of Top of the Pops and Great Railway Journeys to programme such esoteric fare. given the current climate here in America both cultural and political, an account of her story given wide exposure would be more timely than ever.